This entry was posted in Communications, Culture, Education, Government, Healthcare, History, Leadership, Management, Media, Military, People, Philosophy, Politics, Science, Technology and tagged CDC, Ebola, epidemic, fever, hemorrhagic, influenza, pandemic, Spanish flu. Bookmark the permalink. Well thought and well said, Steve. The CDC was formed and has always been a “support” agency for infectious disease control not only in the U.S. but the world. And even though a government-funded agency, it has never been political…until now unfortunately which is why we see this highly respected and world renown resource like a fish out of water: Tom Friedan is a “good man” and a top physician in infectious diseases, but not a politician for Obama and his purposes. Your idea of using our Navy ships to isolate, quarantine and treat Ebola patients is brilliant and pragmatic, and must be made known. It’s the kind of common sense thinking that is not all that common. 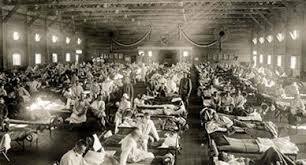 With only the few patients infected that we know of at this time, your idea is also bit far-forward: The job at the moment is a search and find mission–those persons who came in contact with the infected persons, and the other persons who came in contact with those persons, and so on–to isolate to the spread. energy depletion, vomiting, loss of appetite, abdominal pain, etc). It will look like the Flu, with the big difference being the high grade fever over several days which cannot be controlled via normal means. It should be suggested that while Ebola is generally not transmitted except via direct contact of bodily fluids–at this early stage healthcare staff must care for patients as if Ebola were airborne.